Kids in Sweden love them. Adults in Sweden buy them at the shops without telling their kids. They are an energy bomb and are the sweet tooth’s delight. What are they? Chokladbollar or chocolate balls! How can I possibly think of including this in a health food blog, you may well wonder. Well, let’s see. I’ve been working on ways to create this Swedish sweet-tooth’s dream with means other than the usual bomb of butter and sugar. I’ve worked out a version with oats and honey in the past, but that still includes butter. 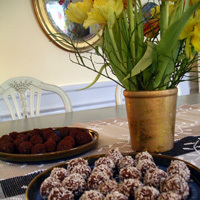 Chocolate balls do have the virtues that you can make them bite-size and they don’t include white flour. However, I’ve got to do better than that. So here comes my solution: chocolate balls made with dried fruit. Some of us (including me) are sensitive to dry fruit and, in general, medical science is beginning to realize that different bodies have different tolerances for high quantities of fiber. So, choose a dried fruit that agrees with you. I love dried apricots, but my stomach growls when I eat more than just a touch of them, so I combine a bit of dried apricot with dried figs, dried apples and sometimes dried cranberries. The great thing about using dried fruit to make these delicious little sweet quenchers is that the moisture and sugar in the fruit allows you to skip the sugar and butter. A little added honey and you are away. Also, if you are lactose, gluten, milk or egg intolerant, this recipe meets your needs! Here is my suggestion which can be made in many variations. Grind nuts and dried fruit in a food processor until they form moist clumps. Add remaining ingredients and blend until a smooth paste. Pour the dessicated coconut or cocoa powder into a bowl. Take a tablespoon of the paste and roll into a ball, dip in the coconut/cocoa and place on a serving plate. Keep refrigerated. Chocolate fruit balls are not just a child’s delight. They are also an elegant finish to a nice meal, particularly if everyone is too full for a major dessert. Just serve them up with coffee or tea after the meal. Very elegant indeed served on a platter and surrounded with a bit of fresh fruit. On several occasions I have written about the virtues of one little old Swedish ladies’ traditions: småkakor or little cookies. In our bigger is better world, these are that marvelous exception. Small is beautiful, particularly when it comes to cookies. If I am drinking a cup of coffee or tea I usually want something sweet with it – I want a småkaka or a little cookie that no one in Wayne’s Coffee or Starbucks is prepared to give me. For years I read stories to children between the ages of 3 and 10 at a nearby school. I always brought with me a tin of home-made småkakor as I knew that mid-afternoon most kids’ blood sugar sinks to levels that make concentrating seem like climbing Mount Everest. My småkakor were of course a great hit, but to console myself that the kids did not just come for the cookies I told myself that they would not have come had I offered cookies but no story. Now, I’m not trying to suggest that processed flour, sugar and big lumps of butter are healthy ingredients. All of those should be minimized in our diets and that is just what little cookies do, particularly during the holiday season when everyone wants to feel, well, just a little richer. 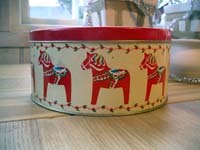 I noticed in Johanna’s marvelous thrift blog that she is running her usual new perspective across metal tins. Here is the childrens’ favorite recipe for småkakor which combined with Johanna’s packaging ideas could make a unique and thoughtful Christmas gift. Preheat oven to 175 C or 350 F. Line a baking sheet with baking paper. Cream sugar and butter. Add syrup. Blend dry in ingredients in a separate bowl and mix into the creamed mixture gradually. Scatter a little extra flour across a clean surface. Split the dough into two and form two long rolls about as long as a baking sheet. Place them on the baking sheet. Bake 15-20 minutes. Allow to cool slightly (but not completely) and then cut into flat, thin strips about 2 cm or 0.8 cm in width. Allow to cool completely prior to storing.